Let’s face it, when we make plans for our next holiday, there is not much we can do weather wise. Except keep our fingers crossed, hope for the best. While at some places you can count on your good fortunes, others, well, are bound to dampen your spirits, literally. And where does Ljubljana come in? The often wrong, but not in this case, Wikipedia, says that yearly precipitation in Ljubljana is about 1,400 mm (55 in), making Ljubljana one of the wettest European capitals. But hey, don’t get all gloomy and think about Rome and Barcelona. We have you covered. There are plenty of things to do and see. Yes, even in the rain. Yes, even with the kids. Slovenia’s first hand’s on science center. It’s guaranteed fun for both parents and kids. My first visit was actually long before I had any kids and long after I grew up, though one might argue the fact I still might more than occasionally act like a child. I just say I am staying young at heart, hey perhaps, age truly is nothing but a mind set. Anyway, because you are encouraged to actually touch stuff here and try all the experiments out, there is no need to be serious, quiet and brooding, you are allowed to have fun, so everyone enjoys a visit. Some say it only takes them an hour to be done with it all, I think you can spend an entire afternoon, learning and experimenting. Check the details here. There are a few indoor playgrounds in the shopping malls, but I have a thing about kids and shopping malls, which is, I try to avoid them. So, the family center is actually a great solution. Located in the down town of Ljubljana, with an excellent view of the castle and within walking distance to all the major sites – it’s a perfect hideaway for a few hours. Until it stops pouring, I guess. Besides it is designed as Ljubljana. You have one Small street and on each side miniature buildings, so if you look closely you are bound to recognize some of them. There is also a coffee house, a labyrinth and a padded little space just for babies. I warmly recommend it. If you have pre-schoolers this is the place to visit next time you are in these parts even if it’s not raining. More about our time at the Family Center. Kids love castles. Of any kind. And the fact that Ljubljana has one is pretty self-evident, since you can spot it from a far, overlooking the whole city. It was a fortress and at one time served as a jail. It will still be enough to get the imagination of the young ones flowing, and you can visit it even on a rainy day. A lot of the sites are covered and those that are not offer a unique chance of some puddle hunting in the medieval surroundings. The reasons for visiting should also include the best views of the city, the fact that most of it is free, one of the city’s famous restaurants is here, so you can have lunch or just a cup of coffee in the castle square, art exhibitions take place all the time and if you come on a Saturday you can crash a wedding. We love visiting this great place. I know, every city has them, but we tend to just forget about them or mistake them for boring institutions, that have nothing to offer. While that might hold true for some of them, it’s definitely not so for all of them. Besides you should just make sure for yourself. 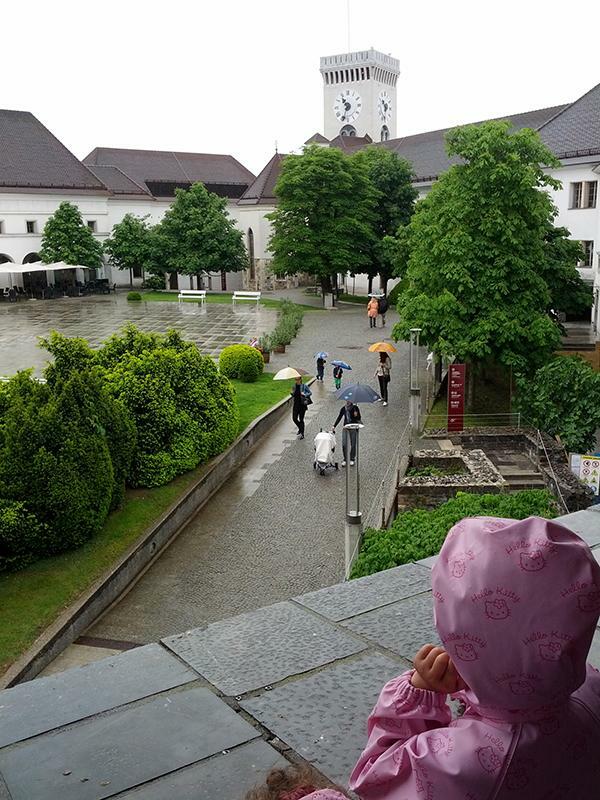 Thank God for rainy days, they give me the perfect excuse to take the kids to most of them and our favorite by far is the Slovene Ethnographic Museum – they say it is a museum of cultural identities; a link between the past and the present, a museum “about the people, for the people”. It has a very worldly feel to it. It is modern, spacious and new, the exhibits are interesting, not cluttered and children friendly as well. I was very impressed by it and I would highly recommend a visit. And my favorite, though the kids still might need some convincing, is the National Gallery, though we really have to tone it down and be on our best behavior there. Both these places are bound to give you a sense of Slovenia, its traditions, culture and a way of life while still keeping you entertained and dry. And here are some of our tips on spicing up any visit to a museum or a gallery with kids. And if you’ve missed it, here are all the things to visit when it’s not raining.